One day here at SAM I received a phone call from a visitor who had enjoyed her time at the museum and who had felt particularly attached to a couple of the paintings here, and who was sorely wishing she had written down the name of the artist because his work was really touching. There was one, in particular: It was a portrait (a self-portrait, she wondered? ), and the man had a moustache (our van Dyck, I wondered? ), and she thought she remembered there were other portraits of the same guy in that room. Ah. Morris Graves. The facial hair was a helpful descriptor, but so was the defining characteristic this woman singled out when describing the painting: vulnerability. Graves’s Self-portrait of 1933 is a rare subject for the artist, who most figured was too private a man to put himself out there by painting himself much. Against a soft abstract background, his form emerges, defined by a rhythmic, undulating outline. His head is perched upon an impossibly long neck. He gazes sidelong out of the canvas with a look that wants to tell us something, and many have thought they knew exactly what. Author Margaret Callahan attached some curious distinctions to Morris Graves when publishing the photo in The Seattle Times in 1948. No doubt Graves’s seasons of mood meant that he left different impressions on the many who encountered him. Besides, perceptions vary: “steely” and “birdlike” to one might look like unapproachable and withdrawn or even admirably stoic to another. We might get a totally different animal to fill the metaphor. My painted images have, somehow, only been very minor Shinto haikus trying to communicate my mind’s range of humanitarian, rational, and irrational experiences and ideas. I’m a fifth-rate rural American painter of the 1930s and 40s. I gladly surmise that you have all along been aware of this. What makes the Self-portrait so fascinating and magnetic is that it seems to reveal something of how Graves saw himself. But what’s in a self-portrait? Are we really learning anything? As a description of oneself, is it any more truthful than another’s description—or any more complete? For me, a self-portrait does reveal; it just doesn’t reveal everything. No one picture, in paint or in words, could convey all the complexity of Morris or of you or of me, and to think we know him from this painting can’t be quite right. The Self-portrait doesn’t say everything there is to say about Morris Graves. Gladly, we get more doses of the artist’s self-reflection in the third floor PONCHO Gallery. Hanging right next to Self-portrait is Morning, a painting where the figure, a slender shirtless man, squirms uncomfortably on his bed, a voyeuristic display in front of us. 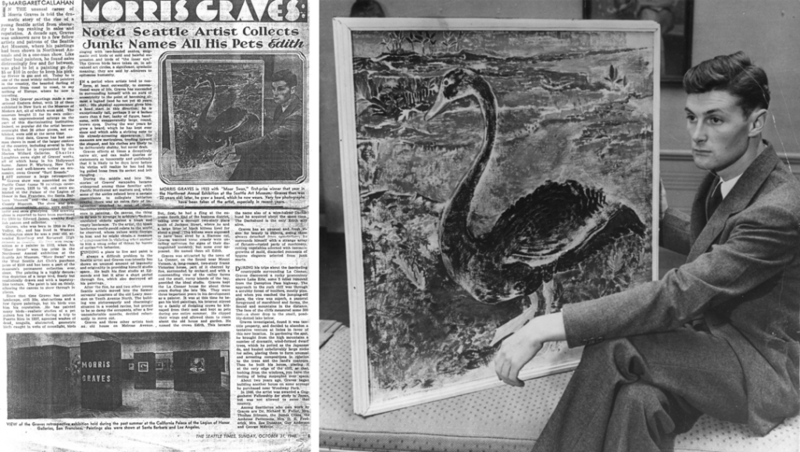 Across the room from these hangs the solitary Moor Swan, a painting Graves exhibited in the 1933 annual show of Northwest artists at SAM, in which it won the big $100 purchase prize. A period photo reproduced here captures Morris with his winning piece, and Morris, it must be said, is looking very birdlike, indeed. Some have read the Moor Swan as a symbolic self-portrait. I’m okay with that, as long as we remember: He is the bird and the pine; He is the moustache and the swan. 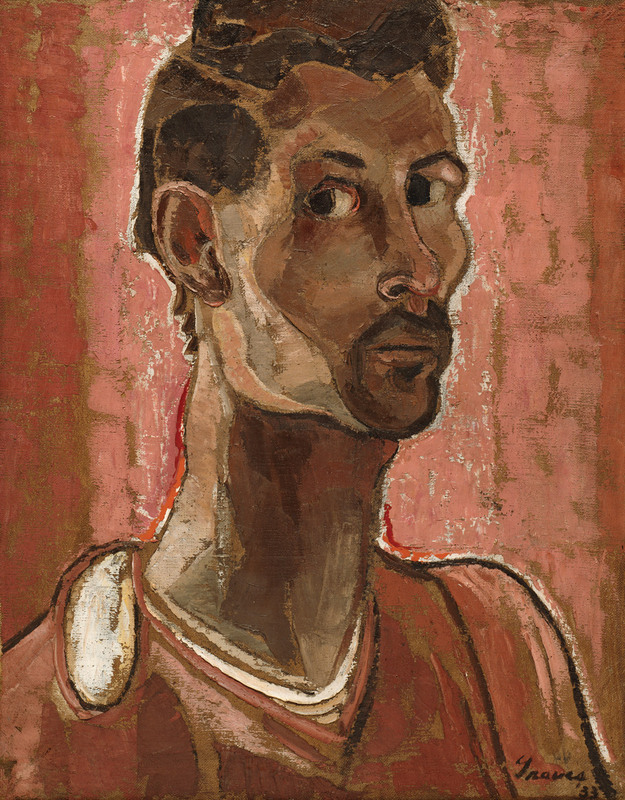 IMAGES: Self-portrait, 1933, Morris Graves (born Fox Valley, Oregon, 1910; died Loleta, California, 2001), oil on canvas, 25 1/2 x 19 3/4 in., Seattle Art Museum, Gift of Florence Weinstein in memory of Max Weinstein, 85.268, © Morris Graves Foundation. Photo published by The Seattle Times, 1933, 1945, 1948. ¹Reproduced in Morris Graves: Selected Letters, p. 97. ²Reproduced in Morris Graves: Selected Letters, pp. 254-255. ³Reproduced in Morris Graves: Selected Letters, pp. 316-317. We’re excited that Disguise: Masks and Global African Art is now open. Check out this video with artist Brendan Fernandes who is producing a work commissioned for the exhibition. Spend more time at Seattle Art Museum this Summer! Summer is right around the corner and Seattle Art Museum is pleased to announce that beginning May 25, the museum will be open Mondays through Labor Day (please note that the Asian Art Museum will continue to be closed both Mondays and Tuesdays). The extended hours will accommodate summer visitors in Seattle and provide additional opportunities to see SAM’s summer blockbuster exhibition, Disguise: Masks and Global African Art, opening June 18. 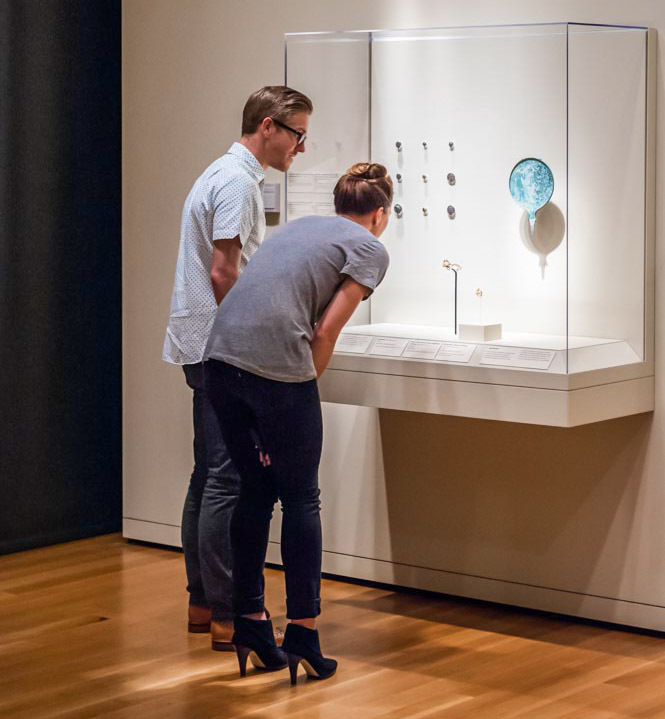 In addition to the extended hours, SAM is offering free admission to military personnel and their families between Memorial Day and Labor Day as part of a collaboration with Blue Star Families, the National Endowment for the Arts and The Department of Defense. Museums in all 50 states, the District of Columbia, Puerto Rico, and American Samoa are participating in Blue Star Museums and SAM is proud to join museums of all genres in providing this opportunity. Up-to-date information can be found on our website or by calling 206.654-3100. The Super Bowl is a mere six days away (February 2, 3:30 pm PST on FOX). Not only is the 12th man gearing up, but so is the Seattle Art Museum. SAM and the Denver Art Museum (DAM) (everyone likes a rhyming competition, right?) have upped the ante on the outcome of Super Bowl XLVIII by betting temporary loans of major works of art on Sunday’s big game. A majestic Native American mask, reminiscent of a mighty “Seahawk” from SAM’s renowned Northwest Coast Native American art collection, is wagered by Kimerly Rorschach, SAM’s Illsley Ball Nordstrom Director and CEO. The Broncho Buster, a bronze icon of the West by Frederic Remington from the renowned western American art collection at the DAM, is wagered by Christoph Heinrich, Frederick and Jan Mayer Director. The winning city will receive a three-month loan of the prized artwork. All shipping and expenses will be paid by the city that loses the big game. Dates of the loan are still being finalized. Here at SAM we are looking forward to showcasing the Broncho Buster. Our visitors will be in for a special treat when they gaze upon the beautiful bronze horse symbolizing the spirit and tenacity of the Wild West. Popular from the time of its creation, The Broncho Buster stands today as an icon of the region and is thought of as the first action bronze of a western hero. Just for the record, SAM’s “Seahawk” is a Forehead Mask from the Nuxalk First Nation ca. 1880. This Nuxalk mask shows the elegant elongation of the bird beak, a sensitive and human-like rendering of the eye/socket/brow area, with painted embellishments on the surface in black, red and blue. The open mouth suggests the ferocity of this bird of prey, possibly a supernatural “man-eater”. Shredded red cedar bark symbolizes the mythical arena in which the dance-dramas would be enacted. …It’s too bad that visitors to DAM won’t be able to experience it there, but they can always come visit SAM. Image credits: Forehead Mask, Nuxalk, ca. 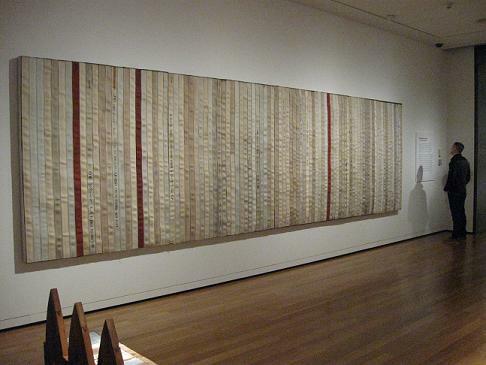 1880, Alder, red cedar bark, copper, pins, paint, 4 1/8 x 11 3/8 x 5 1/8 inches, Gift of John H. Hauberg 91.1.71. Frederic Remington, The Broncho Buster, Modeled 1895, cast by 1902, Bronze; 23-1/4 in., Denver Art Museum; The Roath Collection. On April 30, I begin exploring the inspiring installation on view at the Oceanic gallery. This gallery not only contains the unusual art of the Oceanic islands but also an unusual approach to viewing the work. The inclusion of commission installation pieces created by local Seattle artist Allyce Wood provides, as curator Pam McClusky explains, clues to the objects origins beyond the accompanying textual plaques. 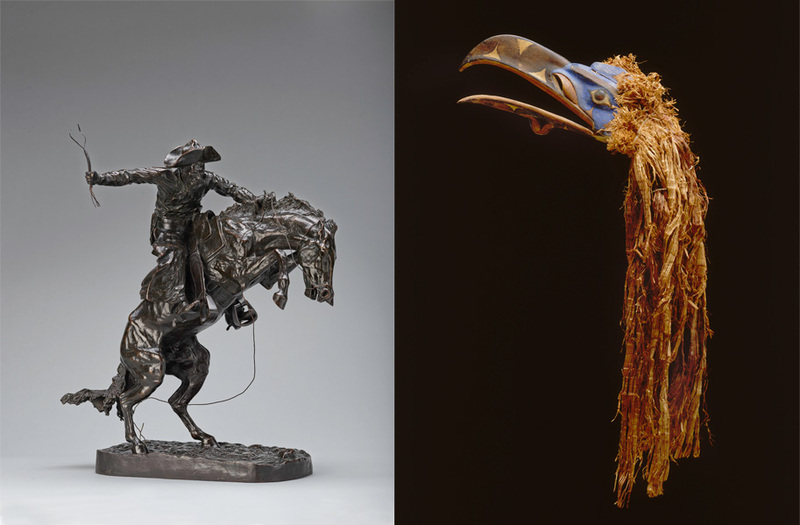 These objects, which were removed from their originally context to a museum context, are reunited with the visual elements of their initial environment. Part One, The Unique Installations in the Oceanic Gallery, examined the ways in which the installation connects the works to their native environment and functional cultural contexts. Part two continues the discussion with a behind-the-scenes perspective on the gallery exploring the mounting of these objects. You may not initially realize that the Yam Masks are displayed on replica yams. Despite the huge size of those in the case compared what you’d expect from a grocery store, these yams are actually much smaller than the champion yams of Papua New Guinea’s Abelam people. Their yams reach heights of nine or even twelve feet! If you don’t believe me, the case text, or have trouble imaging a yam so large an accompanying photograph provides a visual of the yams: taller than their proud owner and nearly as tall as his house! The yams’ size demonstrates the conflict between the museum environment, the objects’ natural environment, and providing proper context. A museum environment dictates that objects should be approachable and so are displayed at an appropriate height. The natural environment for these masks would be mounted on tall yams, a biodegradable natural product where the mask is above our heads. This poses problems in a museum since the natural material would degrade and having the masks at a similar height would inhibit viewing. Their current context in the Oceanic gallery compromises these two methods by shrinking the size of the yams so they can display the mask within a similar context but at an approachable level, much like a manikin. Perhaps we should refer to these yams as, yam-ikins for the masks. These yam-ikins, while mimicking the shape, color, and at least width of the yams, might look like a simple installation created by Allyce, but they double as an intricate and supportive mount for the masks. For one mask with a simple curved back the creation of the yam-ikin was fairly straightforward. The mount for the other mask is far more complicated. The process highlights the skill of the mount makers who need to capture the feel of the object in its environment without compromising its vitality. They must both present the object to the viewer, while restricting its motion and preserving the object for future generations. The mask in question for this mount is beautifully woven. Its reds and yellows contrast against a rich dark black and a few of its original arching feathers remain. In order to accommodate the mask’s dome-shaped interior, mount maker Gordon Lambert created a “pillow” with flaps. 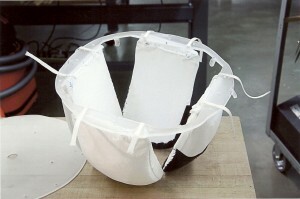 The pillows fill the form of the mask, supporting the fibers without straining or stretching them. They are flexible and are attached to a frame with a hinge, so they can move and respond to the mask as needed. This support rests on aluminum tubes that provide vertical stability. Parts of the pillows that might be seen were painted black and to disguise an awkward connection between the base of the mask and the yam, Allyce created a grass necklace in the proper style. Allyce also created the yams, which wrap around the plain base to provide the masks their appropriate context on a yam. Gordon noted how fun the yam-ikins were to create make due to its inventiveness and the challenges it created. Rebecca Raven, another mount maker, commented on the overall inventive nature of the mounts. For instance, the Asmat War Shields maintain their old steel L-mounts and were originally displayed facing forward in a line. Now the shields twist and turn. In order to turn the mounts for the new display, the mount makers required a specialized wrench to reach a bolt within a shallow space. As no wrench of this kind exists, they built a special one-of-kind wrench just for this project and the mounts for these war shields. Other elements of mounting and installation deal with issues of conservation. While the Marquesan bone ornament, on displayed with the tattooed man and War club, would originally be hung around the man’s neck or head, conservation differences between the ornament and the club required their separation. Therefore the reproduced tattooed Marquesan could not both hold the club and be adorned with the ornament. The current separation between the man and the ornament allows the ornament to interact with the figure while not becoming lost in a crowd of objects. 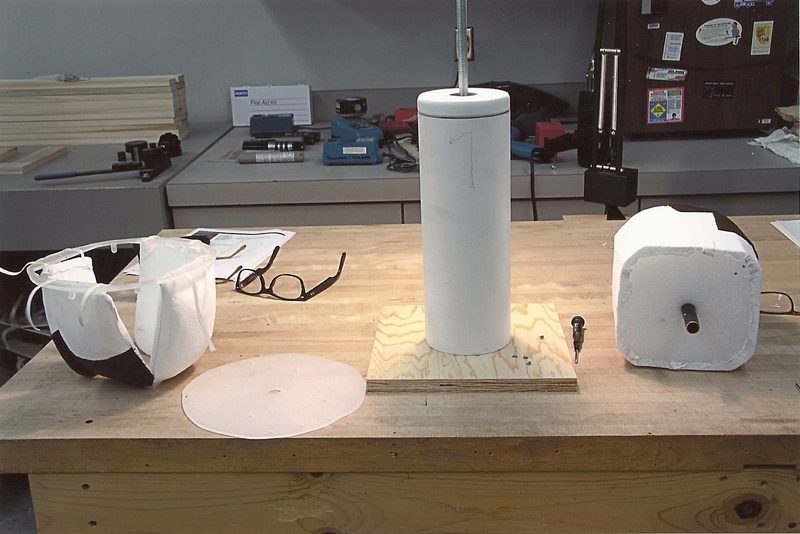 Each part of the mount is ready for final assembly! 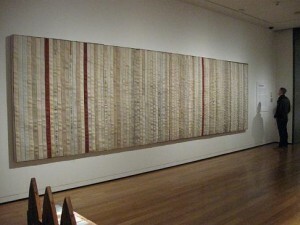 Issues such as these demonstrate the complex problem solving for Rebecca and Gordon in regards to mounting the work. The added collaboration with the Allyce and her installations along with their collaboration with gallery designers and curators provided a new dimension to the mounts they often create. New problems had to be solved for these unique Oceanic objects so they could both be protected and appreciated. Their work with the Oceanic gallery prepped the team for the mounts they needed to create for the current exhibition Gauguin & Polynesia whose Polynesian materials are quite similar to those in SAM’s Oceanic gallery. However, as Pam notes, the permanent Oceanic gallery provides longevity for the museum and the Oceanic collection as opposed to the fleeting views the special exhibition offers. From the unique installation elements that provides visual context to the arts so far removed from their original, non-museum context to the mounting of these pieces we learned so much about the process of creating such a unique and beautiful display for SAM’s Oceanic collection. The considerations, effort, and preparation that all occurred behind-the-scenes for this seamless viewing, is incredible. Each element of the gallery—the installations, the Oceanic art, the mounts, the information panels—come together creating an inviting environment that transports the viewer away from Seattle and onto the islands of the Pacific Ocean. Be sure to check out the final product! The Oceanic Gallery is located on SAM’s third floor. On Saturday, May 5, bring your family to the Seattle Asian Art Museum for Free First Saturday! Explore the exhibition Colors of the Oasis: Central Asian Ikats, and design your own wearable art inspired by gorgeous garments from central Asia. This fun-filled day will feature special performances by Silk Road Dance Company, which has delighted audiences around the country with traditional and fusion dances from the Middle East and Central Asia. Performing Uzbek, Afghani, Tadjik, Azerbaijani, Kurdish, Persian, and Egyptian dance techniques rarely seen in the United States, Silk Road Dance Company offers a unique glimpse of the life, culture, and art of little known regions. Please note that a large public event in Volunteer Park will be taking place all day May 5. We recommend that you allow extra time for parking and walking to the Seattle Asian Art Museum. You also may want to consider biking or taking a bus instead of driving. Free First Saturday at the Seattle Asian Art Museum is presented by Russell Investments with support provided by The Peg & Rick Young Foundation. When walking into the Oceanic gallery on the third floor you may be struck by a mix of the familiar and the unusual. This occurs with both the art and the display. The pieces that comprise the collection include shields, masks, clubs, and figures. There is nothing too unusual about them until you take a closer look and discover the unfamiliar carved designs or shapes whose culture you can’t quite place, that are if you didn’t catch Gauguin & Polynesia. While the works are within a familiar museum setting—some behind glass or on a pedestal—you probably noticed, almost immediately, that they are given an environment. As you walk into the gallery Asmat War shields confront you. They burst out of the forest. Lush New Guinea flora in various shades of green backdrop the shields, rejuvenating them. Oceanic arts curator Pam McClusky decided that in creating this gallery the artwork’s origins required elaboration in order to offer clues about their original function and cultural tradition not only through text, a traditional museum approach, but also through installation. When considering the works from SAM’s Oceanic collection, Pam realized just how unusual these objects were in terms of their origin and context. As most of us approach art from a Western perspective and a Western tradition, the works from Oceania are a bit of a puzzle. For us, art falls into definable categories where the ancient arts of painting and sculpture are favored and in which most art adorns the walls of our houses for decoration or honored in the rooms of our museums for contemplation. While not all Western arts are removed from functional contexts, our history favors these more traditional arts. In the region of Oceania the arts are steeped in culture and context. Their strange context derives from their function and the cultural traditions of the people who made them. The Asmat War shields, Jamasji, for example are not static parts of their environment. They are beacons painted in red and white that contrast from the greens of the forests. They protect the warriors handling them. They twist and turn as they fend off opponents in the fields. Pam decided that installations designed to reunite the objects with their original visual context would facilitate our approach; bridging the gap between Western artistic traditions and the abandoned visual environment and foreign culture of the islands of the Oceania. This approach allows for the animation of the Asmat shields along with the other objects of the gallery. While contemplating the art and its context and relation to the human scale, Pam walked past the windows of SAM Gallery which were displaying the work of Allyce Wood. Allyce’s two dimensional layered environments were just what Pam was looking for. Starting with sketches and images from Pam along with her own research Allyce reproduced the visual elements required to reunite the work with its artistic environment and cultural context. The installation elements allow the glass to disappear and for the objects to return to their original setting. This is one of the most striking aspects about the gallery space. It is amazing how the objects and the installation negotiate the museum space and environmental context. Some objects are intricately paired with Allyce’s installations while the installations for other objects are subtle additions. Each object and its installation are unique, as the installations reflect the origins of the art. A painstakingly reproduced Asmat man stands next to one of the shields, providing human scale and emphasizing the object’s use for warfare. Take the time to explore the gallery. You will discover the interplay between the museum and the origins, the art and the installation. Perhaps you’ll be drawn to the Marquesan man or the male figure from Rapa Nui. The Marquesan man, a reproduced figure created by Allyce sits with a War Club or u’u. The design for this installation derives from an engraving of a Marquesan warrior by Emile Lassalle in 1843. The man stands out for his tattoos, tattoos that identify his power and prestige, and for the u’u that he holds. Compare this u’u to those on display upstairs at Gauguin & Polynesia. They are all very similar with craved heads and a deep, rich color, although the club in the Oceanic gallery lays across the lap of the plywood tattooed figure, mimicking the weapon’s handling by a warrior and merging the object as one of both function and of art. This dynamic counter-play between installation and art demonstrates the seamless method of display created by Pam and Allyce. More subtle installations occur on the walls opposite the entrance with the Rapa Nui male figures, Moai Kavakava, and Melanesia canoe figurehead, nguzu nguzu. Wall paintings contextualize the pieces. A painting of a massive stone statue behind the Maai Kavakava links the figures with their iconic counterparts that encircle the Chilean Island of Rapa Nui, also known as Easter Island. A similar method is used for the canoe figurehead, behind which extends a prow of a canoe. Originally Pam and Allyce planed for a three-dimensional canoe model to extend from the wall, with the nguzu nguzu nestled in the right location. The painted model demonstrates not only a subtle reminder of the work’s functional relevance but also an example of the installation’s developed. Besides the difficulties of mounting and the conservation requirements, Pam and Allyce decided that a three-dimensional model would overshadow the art, taking the installation aspect too far. Furthermore, the painted model allowed for new opportunities; Allyce researched Melanesian figureheads and this model includes a figurehead in a different style from piece on display. When recalling the process Allyce notes the challenges of the work and the differences between her own creations and those for the installation. For the installation pieces, Allyce researched the works and their environment to create the most accurate reproductions possible. As she notes, “I did the research. I embodied the research,” and it shows. The painstaking reproductions of male warriors, both the sitting Marquesan and standing Asmat, demonstrate how her lively approach contributes to the Oceanic gallery. Reproducing the environment, etchings of indigenous population, or other intricate works of art are only one aspect of the installation. Another important aspect of the installation involved collaboration with the mount makers who were tasked with determining how to seamlessly merge the art with the installation in way that protected and conserved the works while allowing them to interact with their less museum-like environment. Part Two, Mounting and Yam Masks at the Oceanic Gallery, continues the discussion on the Oceanic Installation. In this part, which will follow in a few days, we will look behind the scenes at the mounts of the gallery and the collaboration between the mount makers and installation artist, Allyce Wood. There is a display in SAM Downtown’s Wright & Runstad Gallery for African Art holding two pairs of sculptures that provide a transcendent view of “togetherness” and what it means for the spiritual to be connected with the earth. 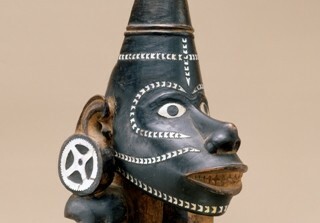 The first is a pair of “Male and Female figures” made by the Baule of central Cote d’Ivoire. The painted wood sculptures represent spirit spouses that inhabit another world parallel to this one, and are prescribed by diviners to promote a healthy living situation between spouses. Imbued with power by the diviner each sculpture is given individual attention by its client in order for the power to be activated. Beside this pair resides a set of Congolese harps carved with faces at the end of their long curving necks to keep their players company and watch their every move. Atop flexed, carved legs their bellies would be filled with sound as the harp couple was played by two musicians travelling as a pair. During their travels the performers recited history as their livelihood and sang legendary epics. Taken together these objects bring to mind the exhibit Theaster Gates: The Listening Room where objects form a collective history and repurposed materials find new meaning as art. The collection of records taken from Chicago’s now defunct Dr. Wax record store reminds me of the spirit spouses who are deserving of more attention. Giving attention to the records in SAM’s twice monthly DJ sets in the Listening Room (come listen next week May 3 & 6!) has allowed people in our community to come together at SAM through music. Although the spirit spouses must be decommissioned of their power by the diviner before they enter the museum the enduring coolness in their expressions continues to give meaning to their remedial function. Similarly the decommissioned fire hoses lining the walls of the Listening Room evoke memories of the civil rights movement in the 1960s where protestors were sprayed with these high pressure hoses during race riots. Our collective memory is jarred by Theaster Gates who saw value in an art object where others saw scrap material. The central question addressed by Bamuthi is, “what sustains life in your city?” This is something he asked many people through the Life is Living festivals he has curated since 2008 in various U.S. cities and forms the inspiration that went into writing “red, black & GREEN: a blues.” By incorporating “the voices of people often left out of discussions about living green,” this conversation on the environment succeeds where others have fallen short, and actively seeks a reimagining of where we place value in our community. [i] This forms a collective experience that, through the stories Bamuthi has engaged and the recycled materials of Theaster’s set inspired by row houses, express our social ecology with power, grace, and rhythm. The success of this performance comes from the belief that “ultimately we are interdependent and stronger through collaboration,” which, like the Congolese harps and Ivorian spirit spouses, helps us maintain good relations and feel connected with the earth. 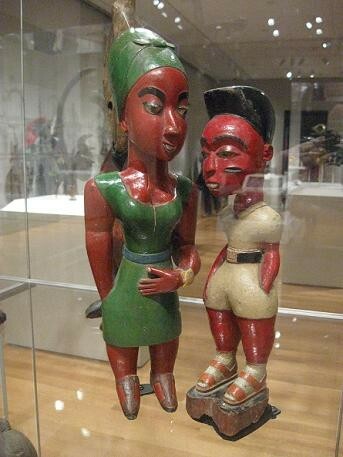 Top photo: “Male and Female Figures,” wood, paint, Ivorian, Baule & “Pair of Harps,” wood, skin, fabric, Congolese, Ngbaka. Photograph by the Author. Taken 4/24/12. JPEG file. This may be your final week to see Gauguin and Polynesia: An Elusive Paradise (it closes on Sunday), but don’t despair. SAM’s collection of Oceanic art remains on view. Shell inlay swirls over the face in a pattern like those found on the painted faces of warriors. Beneath the chin of this figure is a head that is being clutched–although whether the warrior is protecting it or presenting it as a fallen enemy is unknown. Canoe prow figure (Nguzu Nguzu), 19th century, Solomon Islands, Melanesian, wood, nautilus shell, 10 5/8 x 7 7/8 x 5 in., Gift of Katherine White and the Boeing Company, 81.17.1443. Currently on view in the Oceanic art gallery, third floor, SAM downtown.